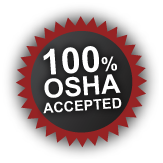 OSHA 24-Hour HAZWOPER Training is required under 29 CFR Part 1910.120 (e) to be successfully completed before any employee begins work on an uncontrolled hazardous waste operation. Those who are emergency response workers or employees who are hazardous waste workers must complete this course. The course itself is 100% online and is audio-narrated, allowing students to interact with the course content. By the end of the training, students will be able to understand how to follow hazard management and hazardous waste regulations, as well as understand how to prevent and protect themselves against hazards. Copyright © , abcrmcoshatraining.com. All Rights Reserved.